Scott McBee – WHAT IS JAMES WEARING? “His Ship Has Come In. 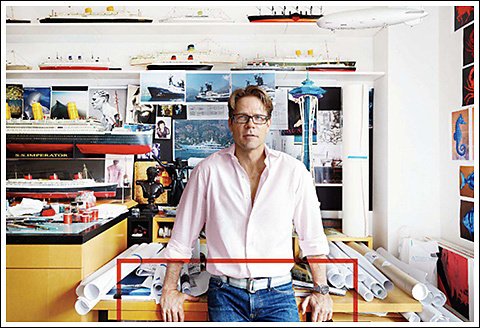 How Scott McBee became the pre-eminent portrait painter of yachts,” Aaron Kuriloff entitles his piece for Bloomberg Pursuits. A fitting tribute to our formidable artist friend — well done Scott McBee! Since Mcbee is near and dear to our hearts, we are of course beyond thrilled to share his success with our WIJW readership. View McBee’s work (yacht and ocean liner paintings) online at www.scottmcbee.com, or find a selection for purchase here in New York City at the Chinese Porcelain Company on Park Avenue. Also, McBee’s fabulous animal paintings can be found at Creel and Gow on 131 East 70th Street as well as at John Fondas’ fabulous, The Island Store in Lyford. Should you want to commission a fine yacht portrait, do schedule your piece early on as there is now quite a waiting list! Stopping by McBee’s studio to celebrate this brilliant press release, I’m sporting a Tom Ford era Gucci red leather biker jacket and black and white striped cotton shirt with French cuffs, pearl cuff links, my black and grey silk paisley ascot by Le Noued Pappillion, Rolex watch, Paul Smith light weight grey wool pants, black alligator belt with sterling buckle by Ralph Lauren, YSL black leather “Windsor” loafers and my fragrance is Creed Original Cologne. If you’ve been following us over the past few weeks, you’ll have seen that we’ve created some rather epic images with the help of our beloved Gabriel Everett. It was just beyond fabtastic to collaborate again with my gorgeous young friend and having the chance to spend some bromantic time together. I do feel that we have a cosmic connection – it truly was a joy working on these pictures. Thankfully, as we mentioned in an earlier piece, it’s not goodbye to Everett for long – in fact we’re thrilled to be reconnecting again in Los Angeles later this month. We’ll be culminating our WIJW California road trip there, and Everett is already scouting some fab stories for us to shoot. We look forward to sharing those with you all on WIJW in the very near future! We still did feel compelled to celebrate Everett’s last night here in the NYC with dinner at my favorite local haunt, Blue Smoke – we drank far too many martinis followed by substantial amounts of rosé – and suitably inspired, we returned to my flat to create the super glam photo above. Recalling the days of Lord Lichfield and David Bailey in Capri, I dressed Everett in vintage Gucci medallion print pants, white linen jacket, Charvet turquoise silk pocket square and woven leather flip flops from Capri, and a rope belt by Orlebar Brown. I’m wearing a Tom Ford indigo and Ivory silk glen plaid jacket, navy and white dot print cotton shirt, yellow retro print silk pocket square by Charvet, yellow jeans by Cassette, Ralph Lauren navy leather D ring belt, Hadleigh’s royal gingham tasseled slippers – we are both wearing Tom Ford Neroli Portofino – Scott McBee’s “Indigo Ostrich” provides a rather splendid backdrop. Often this time of year finds the artist, Scott McBee, and I returning from a spectacular jaunt to Capri, the South of France, or some other sublime seaside destination – this year our getaway is not happening until a little later in the summer, August to be exact – but this hasn’t stopped me from playing out some of my luxurious holiday fantasies…and of course dressing for the part! 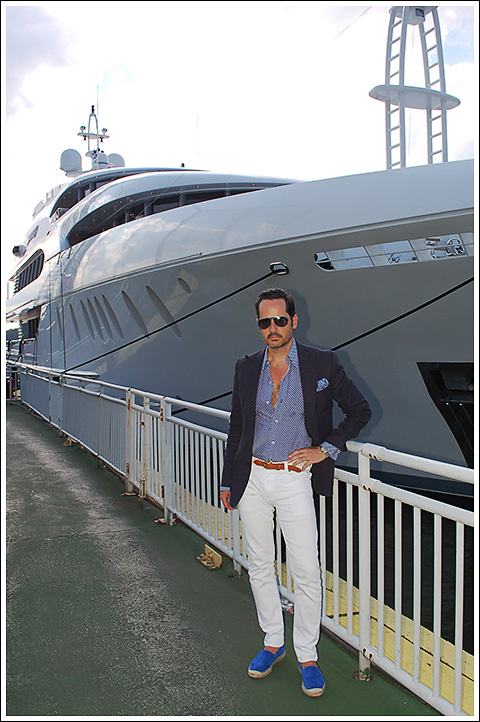 When McBee asked me to join him to look at a yacht for a potential portrait commission, I very happily donned the very best South of France ensemble I could pull together to help create a strolling-through-Monaco-yacht-club scenario. Well, the Chelsea Piers Marina here in New York City is certainly no Monaco but there were actually quite a handfull of rather impressive yachts to be seen! 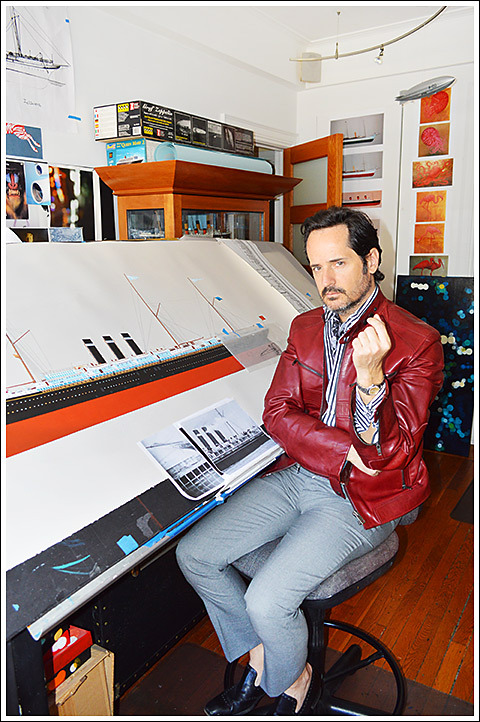 McBee as you may know, is a well know nautical portraitist and many of his grand-scale portraits of the iconic vessels of yesteryear are represented in major museum collections. Needless to say, he has become rather sought after for contemporary yacht portraits as well. In all of his work, McBee brings a sensitivity to the continuity and historic importance of yacht design, inextricably linking the owners of today’s prestigious vessels with those of the moghuls and royalty of the past. For my Monaco-Yacht-Club look, I’m sporting a Tom Ford era Gucci navy cotton pique jacket, royal and white dot print Tom Ford shirt, royal silk pocket square, white Uniqlo jeans, pearl and pale blue sapphire cuff links, a Kiel James ‘Patrick Brigg’s Capeside Docks’ white braided belt, vintage Rolex, royal blue suede espadrilles by Ralph Lauren, and my fragrance is Creed Orange Spice.